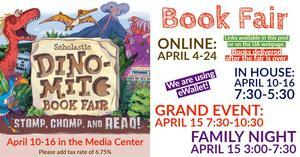 It's time to step back into the STONE AGE with a DINO-MITE book fair. Your kids are going to STOMP, CHOMP and READ this spring because READING ROCKS! 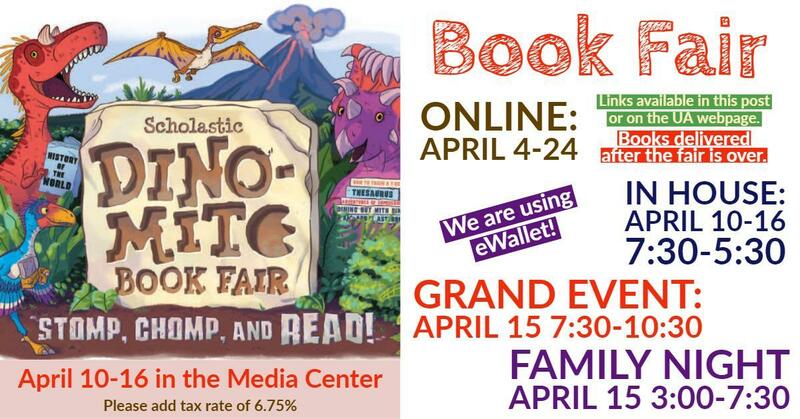 Make sure you check out all the Scholastic Book Fair has to offer both online and in our Media Center. Online Fair: April 4-24. Books will be delivered to the school after the fair is over. April 10-16, 2019. Hours will be 7:30am-5:30pm. Family Night is Monday April 15th, 3pm-7:30pm. ***Please add in the tax rate of 6.75% during the book Fair!! Remember we are using eWallet again this fair.